I like Obama. A lot. I wouldn't want to be him, though. It seems like a ridiculously hard job. And being a craftaholic mom is hard enough. 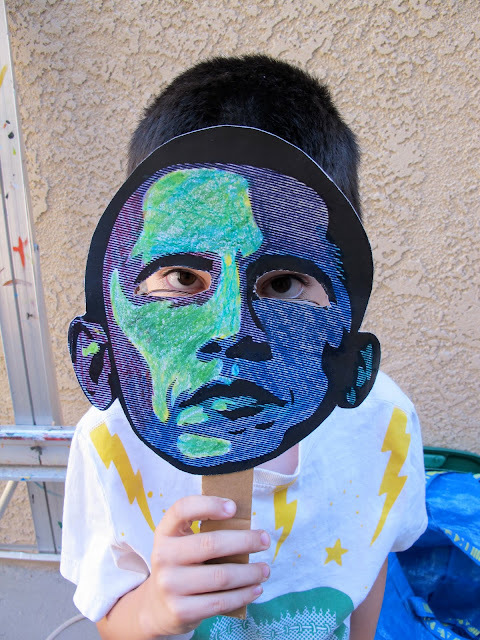 Today is his birthday and I wanted to celebrate with some kind of Obama craft. I didn't take any progress photos for this because it hardly requires any explanation. I took liberty with some Shepard Fairey pics of Obama I found online. Since he stole the original image and we aren't selling these, I figured I could borrow the image for my little craft. I printed out just the face making sure it was about the size needed for a child's mask. Bigger is always better, if you are guessing. I glued the picture onto a piece of old cereal box (recycling) using white glue that I'd thinned just a bit. The kids colored. And I cut them out and taped on a strip of cardboard for the handle. I think he'd like it. A lot. Funny and scary at the same time! I love how the kids tucked the handles into their tops to be hands free. Now, does the boy in the back realize he's making an "I'm not a crook" impersonation?